INDICATIONS Science Plan Feline Senior is formulated to meet all the nutritional requirements of healthy cats from 7 years of age, using highly digestible ingredients. OBJECTIVE - To avoid the excessive intake of those nutrients which may have a role in the development of disease conditions typically seen during this life-cycle stage. Science Plan Feline Senior aids in reducing the risk of feline lower urinary tract disease (FLUTD), including oxalate crystalluria and urolithiasis to which older cats are more prone. 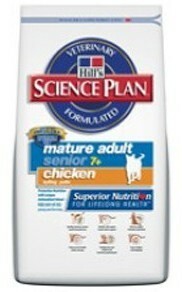 Science Plan Feline Senior dry formulas also contain a Superior Antioxidant Formula to reduce oxidative cell damage.